Lo, Synchronicity and Doctor Poke-a-lot. Isn’t acupuncture a curious profession? Gimme a dollah’ and I’ll stick ya’ with a pin. But that is where my path is headed, and not for the first time. I do hope I qualify as a masochist. I feel I’ve earned the designation. I am dealing with a health matter, which I realize is one way the Universe might shake us out of complacency, and into Devotion to Soul’s True Call. I haven’t felt every malaise to breeze through my existence to be an omen, but this health matter I experience now I believe to be a Call. I’ve felt it from the beginning. A deep inner sense of, “Sleeper, Awaken,” has been present throughout. In fact that literal expression manifested through my subconscious upon observation of my once partner’s abstract painting, which was in no way was intended to convey such an impression. Truly, predominately, we see only ourselves in what is before us, even our hidden selves. O! This is the True Love, and not only due to Divine Assistance, but for the gift of Life itself, and Nature and Beauty And All That Awakens Us to Authentic Gratitude. When we Feel The Great Spirit Close, every cell of our Being feels Love, and this manifests as Ecstasy, and I mean true Ecstasy, not that pale imitation in pill form. 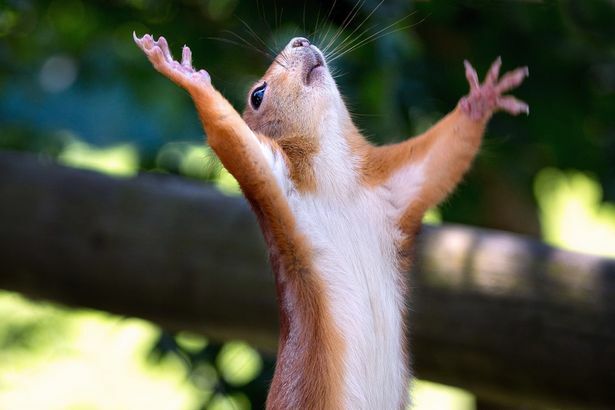 I refer to that pure irrationally happy feeling you get when you see a squirrel . . . or maybe squirrels are just my thing. You, Imaginary Reader, you must know what I mean. Whatever your squirrel is: that something in Nature that makes you happy but you can’t explain why. That’s the glimpse of Ecstasy I mean. The unbridled joy for no reason, that the thinking mind cannot comprehend. The Synchronicity on this occasion, began when I was guided to some literature that was eerily descriptive of my life at the moment it crossed my path. I was veritably reading a biography of my present, penned in past by another, and in this work, a very different form of prayer was suggested. I felt I was to try this. So despite The Lizard King’s stentorian admonition to the contrary, I Petitioned The Lord/Universe/YourWordHere, With Prayer, and quite candidly, Jim Morrison was wrong. You CAN Petition the Lord with Prayer! I addressed God, The Universe, All Helpful Healing Forces In The Light, and I listed all the reasons why it would benefit The Entire Universe For Me To Be Restored To Full Health, the Primary Reason Being: the elevation of any individual’s consciousness in body, mind, heart, and spirit is the elevation of all consciousness, and in addition, empowers said individual (moi) to contribute greater gifts, for the benefit of all involved. I imagined an enormous gathering of compassionate humans supporting my motion. The whole of my heart, mind, body and soul was in this prayerful petition. I really rather think I made a good case. So, what happened?! my imaginary readers inquire. Did it work? Did God reach through your ceiling and heal you? Yes, She did, but I didn’t know it then. What happened was, when I stood up after the petition, everything in my Fotomat sized apartment was precisely the same, except for one thing: The little temp gauge on my heater had suddenly stopped showing the temperature, and now blinked the word ‘Lo.’ From the time I moved in, up until I began praying my petition, it was only displaying the temp. Yes, it was. A bit later, me and a soulmate of mine, someone I had known for a very long while and connected with deeply, someone who changed my life for the better forever and I his, (that is perilous grammar I realize) had reached a troubling place. We had never been romantically involved, the notion was unspeakable, yet his platonic love for me and my role in his life was agonizing to his new wife. He could not help but speak of me, nor I him, (grammatically perilous I tell you!) and it occasioned his new bride the greatest suffering, even though we were each completely in love with someone(s) other than each other. The mere thought of kissy-kissy was as unthinkable to us as it would be between any two siblings. Yet with the greatest grief I realized, *back of my hand, pressed to my porcelain brow* I would have to end one of the best friendships I’d ever shared with anyone. It was hurting his partner. I rationalized conversational continuance for a time, but at a point I knew this was not right. Marriage takes precedence. I ended a wonderful friendship. It absolutely devastated me, and devastated him as well, yet we both recognized it was the right thing to do. I grieved and still can at times. Crying and all that rot, and his letters of grief, grieved me all the more. He has an unusual last name. For the sake of his privacy in this ridiculously long blog entry, let’s say his last name is Homminahommina. Summer passed, and Autumn air arrived. I went to turn on my heat for the first time in months, and it did not work. I called the Landlord, and he said he’d have someone out the following afternoon. I’m a late sleeper, but I felt I should arise early for some reason. (Thanks Intuition!) I did so, and the moment I was presentable, a knock happened upon my door. It was the landlord, who said he believed it was only the battery in the gauge on the wall that was occasioning the interruption in heat. A low battery would certainly explain why it was blinking, “Lo!” all summer, and I should clarify, it is spelled just like that on the gauge, Lo. Pardon me while I climb up into the heights of my pedantic pedestal for a moment. (I LOVE it up here!) “Lo” is an archaic term, used to draw attention to an interesting or amazing event. And ‘Lo’ only appeared in my flat, blinking, immediately after my petition to God, and that is the Truth. This is where the Twilight Zone theme song comes in. This is where goose bumps arrive and my feet tingle like mad. I told my landlord I could replace the battery all by myself. In response I got that, “Are-you-sure? You’re-just-a-helpless-woman,” look, which I find infinitely more nauseating than charming from older men, but I also realize I have no right to judge or vomit over another’s well-meaning-but-impossibly-condescending perspective. However, my day got rather busy, and I never did look up Stick-Ya-With-A-Pin doc. And at the end of that busy day, before bed, I prayed over the matters of my health, and I prayed over the soulmate friend I had let go and hurt and missed. “What am I to do?” I asked God. Letting him go felt like a Spiritual test I passed. But at the same time, I wondered, did I really do the right thing? Then today, my landlord shows up out of the blue, uninvited, unannounced, unprecedented, and hands me the business card we agreed he did not need to hand me, for the acupuncturist. And guess what the last name of this acupuncturist is? Tears instantly came to my eyes. ‘Twas the same unique and rare name, of my Homminahommina soulmate/friend that I had only just let go of and prayed for the night before. (She’s a HUGE Aerosmith fan). I have not been to the acupuncturist yet. My appointment is soon. But I am cured because I am Guided by the Power that can Cure, and being on the path of Healing is Being Healed. The only distinction is one of Time which does not exist, except in the mind of man. So I claim Health Now, and the best celebratory victory move for a word woman like me, is to write the longest run-on sentence in the history of blogging, naturally in the form of a synchronistic review, to elucidate the point that its really all quite logical you see. I double dog dare you to read the ensuing run-on, aloud, in a single breath, with a straight face. The Congressional Petition to God on the yoga mat with Jim Morrison created the archaic blinking Lo which lead to the landlord’s arrival which lead to the stick-ya-with-a-pin doc’s biz card with the same unusual appellation of the soulmate I had only just let go of so that the Universe might make way for this new Homminahommina to stick me with a pin for a dollah’ . . . or many dollars actually . . . for my fellow mascochists, I regret to inform you, the price of voluntary suffering has gone up considerably, yet that only makes it all the more painful, so Rejoice! Now Nellie Naysayer (presently gasping for air) will say, that if one looks for patterns, one will always find them, in absolutely anything and everything, and all this proves naught. Yes Nellie, but I was not looking for patterns, and I am not basing perception on them. I am basing this sense of healing on this feeling, this Sleeper Awaken feeling, that yearns to help me recognize The Something More, that is guiding, not just me, and not just all humanlings, but every aspect of this Creation we share. And this Force reveals itself, sometimes in BIG ways, and sometimes in subtle Homminahommina-look-at-your-trippy-thermostat ways. And how do we know the difference between guiding synchronicity and just coincidence? Presuming innocuous coincidence does exist, Intuition alone, the feeling generated by the experience, would be the decider. This is not the first, and certainly not the most palpable instance of Synchronicity in this “strangest life I’ve ever known,” but it is the one transpiring Now, and Now is the only moment I have, so Now is the moment I Share, no matter how banal or peculiar, for it is the Soul’s Call to share, and that Soul’s journey is the journey I am at long last learning to recognize myself upon. Material Circumstance is the Effect, but Soul’s Call is Cause. Now for you dear Nellie, I plight to return and tell you all about my stick-ya-with-a-pin session with Doctor Poke-a-lot, but if you don’t mind, my Intuition is telling me to stop sitting at this computer and go outside and see a squirrel! You, my most amazing and wonderful woman, are simply one brilliant writer. Your love of language shows as your stories flow. And while I laughed aloud at the picture and declaration of exasperation of your totem animal friend, I think both he and I would share a walnut and be content to both read and listen to you wax on and on and on….